Don Chalmers Ford is an independent business franchised to represent the Ford Motor Company in vehicle sales and service in Rio Rancho, New Mexico, a city of 94,000 just outside Albuquerque. The company motto, “Real Value, Real People, Real Simple,” is brought to life by Don Chalmers Ford’s commitment to “customers, quality, and community.” Providing customers with an innovative, non-traditional dealership experience is key; for example, visitors are always welcomed by a greeter when entering the showroom, which is designed to surround them with a relaxed, “art gallery” atmosphere. Don Chalmers Ford is the only automobile dealership to receive the Quality New Mexico Zia Award for Performance Excellence, the state recognition based on the Baldrige Award. The company has a workforce of 182 employees and recorded $126 million in gross sales in 2015. Don Chalmers Ford has received the highest national recognition for customer satisfaction and market share available to Ford dealerships 13 times over the last 17 years. This feat has only been accomplished by 4 percent of domestic Ford dealerships. Don Chalmers Ford’s total sales volume increased from $109 million in 2012 to $126 million in 2015. Total dealership gross profit increased by 13 percent during the same period, with the percentage of gross profit growth in 2015 exceeding Ford's national benchmark level by 8.4 percent. New employees at Don Chalmers Ford are mentored by senior leaders and work with the general manager using the firm’s “How I Connect” guide that aligns each individual’s role to the company’s core values and to delivering the “DCF Experience.” This has helped increase the retention rate of sales consultants from 56.3 percent in 2011 to 71.4 percent in 2015, significantly higher than the national average of 26 percent for non-luxury brand dealerships. Process performance is analyzed on a daily, weekly, and monthly basis. In-process and end-process measures are used to control and identify opportunities for improvement of work processes. Of the current 20 in-process measures reported for support processes, 75 percent are currently at or above benchmark levels. Don Chalmers Ford has received the President’s Award—the highest national recognition for customer satisfaction and market share available to Ford dealerships—13 times over the last 17 years. This feat has only been accomplished by 4 percent of domestic Ford dealerships. Don Chalmers Ford’s customer engagement and satisfaction have achieved benchmark levels in each market segment and exceed regional benchmarks for service locations, according to Ford Motor Company’s Consumer Experience Index (CEI)/Net Promoter Score. Overall customer satisfaction for new vehicle sales and for maintenance and repair (CEI score of 88) surpassed the ratings for Ford dealers of similar size in the region (average CEI score of 81) in 2015. Customers have rated the dealership’s new vehicle sales at 90 or higher for engagement and satisfaction from 2013 to 2016. Ninety-six percent of customers who bought used vehicles from Don Chalmers Ford report that they are willing to recommend the dealership to family and friends. Bonuses, incentives, discounts, and career opportunities are combined with traditional benefits to help address the needs of a diverse workforce. 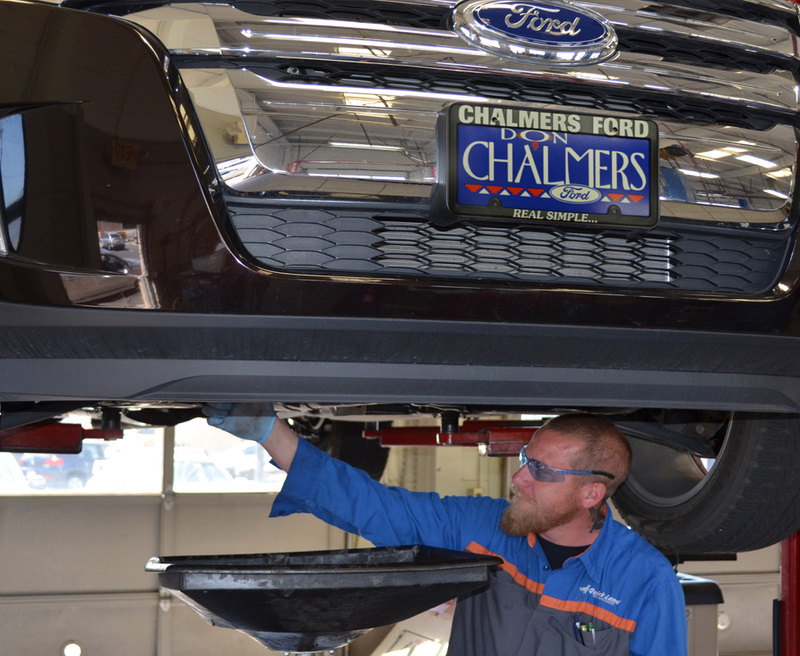 For example, Don Chalmers Ford supports its workforce through a free on-site wellness clinic, staffed with a certified nurse practitioner, for employees and their families. Don Chalmers Ford’s support for learning and development is balanced across a focus on customers, operations, compliance, and leadership. Activities include new employee orientation training within the first 30 days, followed by role-specific sales or technician training, annual safety and compliance training, ongoing training, and leadership training. In 2015, each member of the Don Chalmers Ford team received an average of 71 hours of training, surpassing the dealership’s goal of providing a minimum of 42 hours per employee. Don Chalmers Ford management engages its workforce through the Driving Forward Report, a monthly status update on news and operations issues of interest to all departments; the Consumer Experience Movement, a program to increase employee engagement; weekly and monthly Business Plan Review (BPR) meetings; one-on-one coaching; and an open-door policy. Senior leaders also provide real-time, two-way communication across the workforce through customer satisfaction conversations and workforce feedback coaching sessions. Each month, employees submit ideas for improvement to the senior leadership team, which then reviews, discusses, and prioritizes them. Each Don Chalmers Ford team member annually performs a community service project with an organization about which he or she is passionate. Through this process, employees have donated an average of 40 hours per year for the past four years. To realize its vision to be the premier Ford dealership in New Mexico, Don Chalmers Ford strives for continuous improvement in net cash, working capital, and service absorption (an efficiency measure that calculates the percentage that the parts, service, and body shop operating gross revenue covers the dealership’s overall operating expenses plus the total of fixed expenses and dealer salaries). For example, Don Chalmers Ford currently exceeds the Ford recommended level for service absorption of 80 percent. Net cash improved by 330 percent from 2013 to 2016. Working capital increased by 42 percent over the same period. Don Chalmers Ford uses a systematic 12-step strategic planning process to develop annual plans that are deployed to the workforce through a balanced set of key performance measures, which are analyzed and communicated on a daily, weekly, and monthly basis. These measures are integrated with the company’s BPR. The strategic planning process is used by management to effectively collect and analyze data relevant to setting and meeting long-range goals. This fact-based approach helps ensure that Don Chalmers Ford is setting realistic annual targets for the BPR that are completed at the senior leader and manager levels, and then cascaded to the teams. Through its in-process system, Don Chalmers Ford documents, deploys, and analyzes day-to-day operations and work processes to ensure that key requirements are met. Process performance is analyzed on a daily, weekly, and monthly basis. In-process and end-process measures are used to control and identify opportunities for improvement of work processes. Of the current 20 in-process measures reported for support processes, 75 percent are currently at or above benchmark levels.